In this second part of a series designed to examine the basics of Google Analytics, we look at Custom Alerts (the first article was on Understanding Audience Overview). 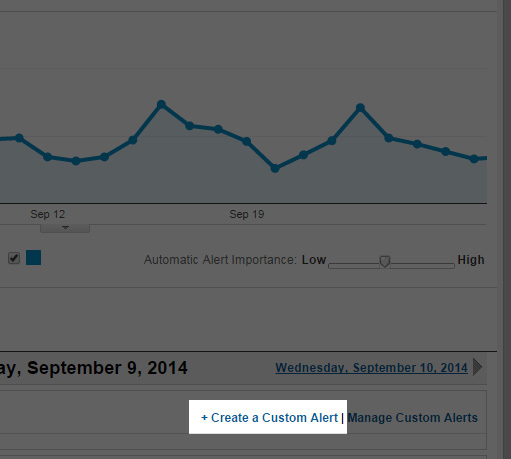 Custom Alerts in Google Analytics allow you to keep track of extensive fluctuations in your analytics data so if something unexpected happens then you can act upon it sooner rather than later. This could be amongst others a rise or dip in visitor numbers, bounce rate or if you have an e-commerce website, fluctuations in revenue. Google Analytics will automatically alert you if it deems that something unexpected has happened or you can tailor it to send alerts that you define yourself. The alerts can be defined to notify on a daily, weekly or monthly basis. 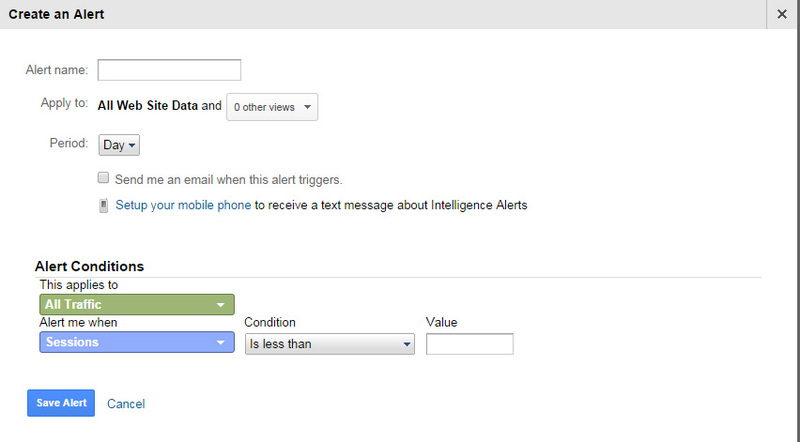 To create an alert, under the left menu of ‘Intelligence Events’, click Daily, Weekly or Monthly Events. You will see a popup box where an alert can now be defined. Alternatively all traffic can be tracked. Content targets – this can be the number of searches used on the website or time spent on the website after the website search has been used. The example we will use to set up our alert is a simple e-commerce alert where we would like to include all visitor numbers to the website and alert us when our weekly revenue falls below a nominal amount. Select the second alert condition under ‘E-commerce’, choose ‘Product Revenue’ and choose the revenue figure threshold that you want to be alerted. As has been shown Custom and System Alerts within Google Analytics are a very useful way of keeping track of changes to user behaviour, visitor numbers, conversion numbers and fluctuations to product revenue amongst others. Alerts work equally well with all types of websites and are flexible enough to define the alert tracking that is appropriate to you and your website.